At four o’clock yesterday morning, my whole family left for our bi-annual trip to the Outer Banks. Due to the unforseen scheduling conflicts of band camp and my accelerated degree program, my daughter and I have been cruelly left behind. I love the ocean. 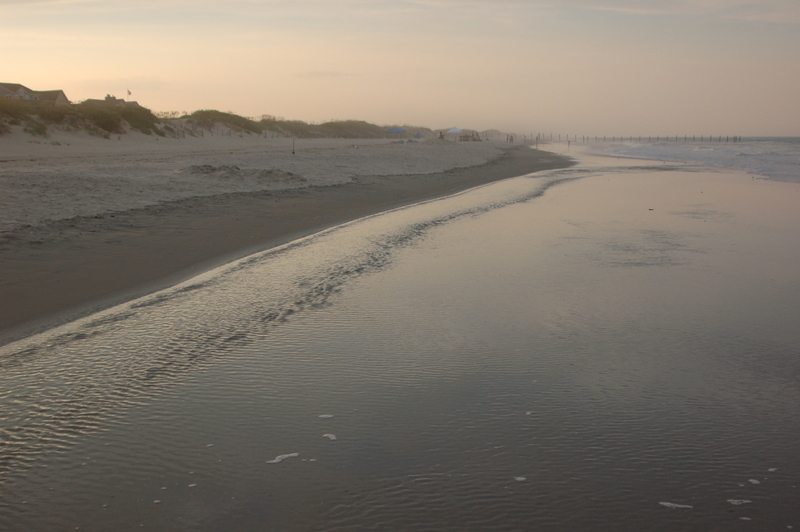 For me, the Outer Banks is the creme de le creme of beach vacations. Sleeping in, boogie boarding with the kids, reading on the beach, taking long walks by the water, skipping make-up, wearing “comfy” clothes, playing games and laughing with my family – these experiences comprise the epitome of relaxation for me. Missing just a few hours of the most relaxing week of my year should be causing me great distress and heartache. And yet, I am pleasantly surprised to be experiencing something entirely different. Although I’m not at the beach, I still have the mindset that I am on vacation. And it is the first time in my life that Lovey and I have had the chance to spend several days together alone. We are taking full advantage of it. Since yesterday morning I’ve slept in until 10:15 am (Lovey couldn’t get past 8:30), watched two movies, and shopped at Target for school supplies. We had supper at Panera – why does soup taste so good on a rainy day? – and watched another movie before heading to bed. We went to church this moring for one service and ordered pizza on the way home, forgetting it was only ten o’clock. The local pizza shop was kind enough to throw a pie together for us even though they weren’t officially opened and we ate our pizza at home at 10:30am. As I blog, Lovey is organizing her binders and notebooks for her fall classes. She’ll also be practicing her flute. Then, we’ll be watching yet another movie together this afternoon. All movies have been chosen by my daughter. Some are beloved favorites and some are new releases we’ve never seen before. I’d like to squeeze in a nap at some point as well as start reading a book from the pile in my closet. Later, if the rain stops, we’ll be heading to Long’s Park to see Hot Club of Detroit. I’ve been looking forward to this concert all summer! If the rain doesn’t stop, we’ll just continue to hang out at home doing whatever tickles our fancy. * Do the entire hike at Kelly’s Run. It’s beautiful and difficult. I’ll get some exercise for my body and my soul. * Shopping for me. I start teaching the August 22. My wardrobe needs some help and I’d rather shop alone. * Bake something yummy. I’m thinking a coffee cake or cookies would be delicious. Or how about both? * Read on the front porch – for hours. Perhaps I can finish the book I start today. *Blog. I have already have a few ideas I want to explore. *Take my regular walk. This past week was so hectic that I couldn’t fit my daily walk in. It is so easy to get out of the habit and I want to make sure that doesn’t happen. *Play the piano for pleasure. When no one is around, I know I’m not annoying anyone and I can play as long as I like. Or until my fingers give out. *Spend some time researching our next vacation destination – wherever that may be. *Get a massage. I have a gift certificate I’ve been holding on to. It’s the perfect time for a bit of indulgence. While I’m treating these next few days as a staycation, I still have some responsibilities I can’t get away from. I’ll be working on preparations for the classes that begin in a week. I have reading, writing, and calculations for my Statistics class that need to be completed. There is cleaning and packing to do as well because Lovey and I will eventually join the rest of my kin for a brief respite in the Outer Banks. I am sad that I ‘m missing the full experience at the beach. I especially miss my men. However, this time at home alone and with my daughter, who will be almost fifteen and is growing up before my very eyes, is an unexpected gift that I wouldn’t exchange for anything. Nice post Steph! Enjoy the peace and quiet while you can. Thanks, John. I intend to wring out every moment of relaxation I possibly can. Missing You in OBX. Drive safe and bring some food reinforcements…your men are rapidly consuming all our junk food.